Cartoon faces have to be one of my favorite things to draw and I've filled sketchbook upon sketchbook with different kinds of faces. You should find the following information helpful for drawing your own faces, and I sincerely hope that you get as much enjoyment out of drawing them as I do. So What's in a Cartoon Face? Any face is made up of the following elements: the head, nose, eyes, mouth, ears, hair. It's easier to draw the face once you have broken it down into these different parts because you can become familiar with the different parts and then begin fitting them together like a jigsaw puzzle. Hold your pencil lightly on the page and start with a circle. This will be the base of the head. Cartoon characters come in all different shapes and sizes but when you're doing your first sketch for it, it's best to stick with geometric shapes. The head doesn't always have to be a circle, but I find that it's usually the best and easiest starting point. Depending on the type of character that you're drawing you may want to add another line on the bottom of your circle to make the jaw; it's up to you. The next part of the head to tackle is the nose because it lies in the center of the head and is a good point of reference for drawing all of the other features. There are many different styles of noses and you should start trying to take notice of how the noses of different cartoon characters look. 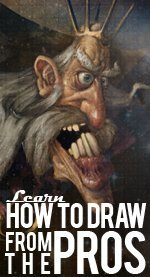 To get you started you may want to check out the nose drawing tutorial here. After the nose you should draw the eyes and then the mouth in that order. When doing my own drawings I usually draw just the eyes, then the mouth and then I'll go back to the eye area and at the eyebrows and maybe some wrinkle lines if I'm drawing an older or tired character. The next step for drawing cartoon faces should be the ears. Drawing the ears before the hair gives you a reference point that you can use to draw the hair more easily. Without an ear it can be a little difficult to know exactly where the hair line should go on the face, so do yourself a favor and make the ear first. The last step is always the hair. Remember to always draw lightly at first and don't be afraid to get a little bit experimental with the hair. You're drawing cartoons and cartoons do not need to look realistic so feel free to let your imagination wander and try a few different hairstyles on your character before you choose which one looks best. Happy Drawing!